Article: Investors Interest in HR Tech - what it means? Investors Interest in HR Tech - what it means? It doesn’t take much for one to realize the trends here. The investor interest in HR tech companies has continued to accelerate and soar. In fact, with close to $14 billion invested in about 2000 HR tech companies globally, this is one of the tech investment avenues that do not show signs of slowing down anytime soon. For last 3 years, the HR tech industry has consistently attracted $2 billion or more in investments, with US & Europe taking the majority share of investments. The other trend that we are experiencing is of partnerships and consolidations, a trend that is likely to continue in the future as well. With many HR tech verticals like recruitment, performance management, and engagement being crowded with multiple players, the need for consolidation is high. The other factor driving this trend of consolidation and acquisition is the realization that one doesn’t need to be everything to everyone. Companies realize that while they can focus on their core strengths, they can look to collaborate with vendors in adjacent areas with a view to provide clients with an integrated solution while also ensuring they create entry barriers for niche players. In the recent past, although many niche players have emerged, they have had to integrate with the larger HR ecosystem to be effective. The other aspect that one can see in such news reports is the wide variety of solutions that are now available in the HR tech space. While this is good news, it also signals the dilemma that buyers face while selecting vendors to partner. We see specialized players like Qualtrics who helps organizations focus on the employee experience, Fuel50 which helps companies define and track multiple career paths for their employees, MoveGuides which help companies manage global mobility effectively, and EdgeNetworks which is helping IT organizations in talent acquisition and workforce management. This indicates that many HR Tech companies irrespective of their size are now taking highly specialized positions in the market and are looking to create differentiation not just based on technology but also based on their functional understanding of the solutions. This would mean many HR tech companies would look to build their functional competencies and present their solutions from a perspective of a domain expert. This is likely to grow as HR function in the recent past has become highly specialized with talent acquisition, compensation benefits and learning and engagement becoming Centre’s of Excellence (COE) within the organizations. 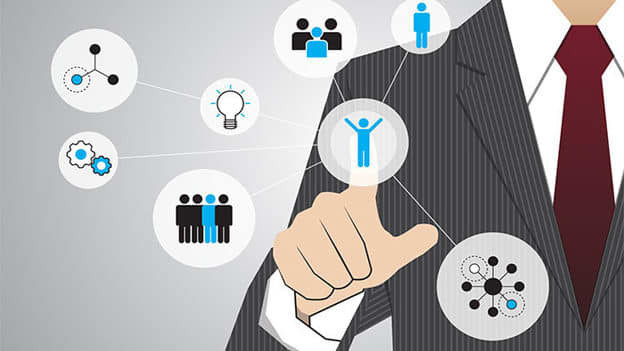 With HR operations being another specialized setup either within or outside the organization, it is imperative for HR technology solution providers to talk to their buyers and users, not only about the language of technology but also the language of their field of specialization. In the last month quite a few HR companies announced partnerships. 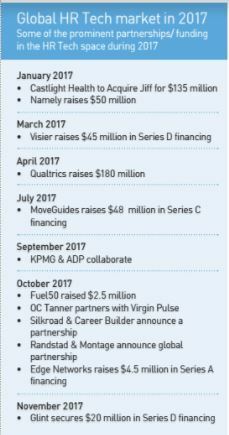 The one that gives further impetus to a prediction by Josh Bersin of “wellbeing” as a fast emerging category within HR tech is that of OC Tanner’s partnership with Virgin Pulse. While OC Tanner is a company founded in 1927, Virgin Pulse came into existence in 2004, this is clearly a good news with 2 leading players in their respective categories coming together to offer a more integrated solution. OC Tanner has anchored itself around employee reward and recognition while Virgin Pulse is anchored around employee wellbeing. This partnership will ensure that both companies are able to offer a comprehensive solution to their customers by leveraging technology and personalized insights. Through their partnership with SilkRoad, CareerBuilder has also ensured that they are able to offer more end-to-end solutions by integrating their on boarding module to enhance customer and user experience. This partnership will also ensure that together they are able to fight with many other HR tech solution providers in these 2 spaces. So while with Virgin Pulse & OC Tanner, the combination of the two players signifies creation of a new category, in case of Silk Road and Career Builder, it signifies the growing need of HR Tech buyers to find a vendor with end-to-end solutions. While this may not mean death for the best of breed solutions, HR tech buyers will clearly look to lower the risk of integration with multiple platforms. This is also indicative that HR tech vendors will increasingly partner with the best of breed solutions rather than trying to build the complete end-to-end solution themselves. This would mean that large organizations like SAP and Oracle will continue to face competition from not only best of breed solutions, but also from such group of best of breed solutions in future. The other announcement indicates to a different trend where HR services provider Randstad has partnered with a best of breed technology solution provider, Montage. This is an indication that pure play HR services providers are not immune from the HR technology onslaught. These two worlds are likely to collide and merge to ensure they again provide integrated solutions to customers while improving the overall user experience in the process. All these trends surely indicate that HR Tech continues to attract attention from investors, customers, and potential partners. The space is bursting with action with many players creating innovative solutions. The buyers of HR technology will have to ensure that they carefully evaluate various options available in the market. The buyers will increasingly be focused on their own processes and business benefits the HR technology solutions are going to bring in. We are already seeing the HR technology buying process becoming complex with cross-functional teams from HR, IT, Supply Chain & CEO getting involved in the process. The world of HR & HR technology is surely going through a lot of changes and one does not see any signs of that slowing down anytime soon. So fasten your seat belts the ride has just begun.